Whether or not you know it, there might just be another person coming between you and your love. You could be in a many-years strong marriage and feel very committed to your mate. We’re here to tell you that there could actually be another person standing in the way of your relationship being as close and connected as it could be. Don’t worry, we aren’t talking about an affair here. People have this tendency to create disappointment for themselves by focusing on a past that may not even be accurate! Even if it is, what it comes down to is this, if you frequently compare your partner-or yourself-to past memories of him/her or you, you are only setting yourself up to feel bad. There is nothing wrong with enjoying happy memories of past times of connection, but troubles are created when those memories become measuring sticks against which you judge where you are right now. It’s not only a fact of life, it’s also a wonderful thing. If none of us ever changed, there would be no growth and no potential for new exciting experiences. When day-to-day present life starts to feel dull and passionless, it makes sense that you might turn to a great memory from the past to charge you up. When this becomes a habit, however, you may find that you are carrying on a relationship in your head with another person-the person your partner used to be or someone else from your past. Either way, your present relationship and you are not served. Jody and Jack have been together for 32 years. Those years have been filled with plenty of ups and downs but things usually stay pretty even-keeled. They enjoy their kids, grandkids and each other. However, both also feel a bit dull about their relationship. For her part, Jody takes comfort in memories of her early years with Jack. In particular, she remembers one Valentine’s Day when he baked a dozen heart-shaped cookies, iced a loving message on them, and hid them throughout the house. It was a wonderful day of romance and passion as she found the cookies, read the message and they spent the rest of the day in bed! She longingly wonders why he doesn’t do things like that anymore. If you find yourself loving a past “other person,” try these tips…. What a wonderfully romantic act! We don’t blame Jody for wanting more passionate moments as she and Jack experienced years ago. We do encourage Jody and Jack to turn their attentions to right now, to love the one they’re with. If you choose to stay in the relationship you are in right now, we suggest you do what you can to experience love, passion and connection right now! This might mean you notice and appreciate what is going right in your relationship. What feels good to you that IS happening? While Jack hasn’t repeated that romantic Valentine’s Day, he does send loving e-mails to Jody every day from his work computer to her work computer. They may not realize the potential moments for intimate connection that are already there but go overlooked. As you shift your focus to the present and begin to notice what is going right in your relationship right now, be on the look-out for new ways to increase passion. Jody might choose to treat Jack to the romantic cookie hunt he gave her all those years ago. She may find it just as fun and exciting to create as it was to receive. 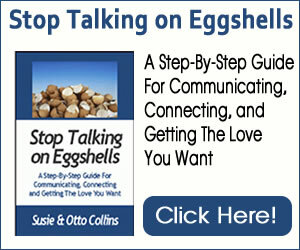 It is also important that couples communicate with each other how they want to be loved. Everyone is different and what feels romantic and special to some, just doesn’t feel the same to others. A cut flower bouquet might seem like a waste of money to some, but to others it might just make their day. As you share with your partner what you like, do so without blame or judgment. This isn’t about what he or she isn’t doing, it’s about letting your love know what you want and then allowing it to happen. As we said above, there is nothing wrong with enjoying pleasant memories of the past. You could even share them with your partner-re-create a favorite moment and see how it feels even better in the present day. right now and then explore ways to feel even better together!